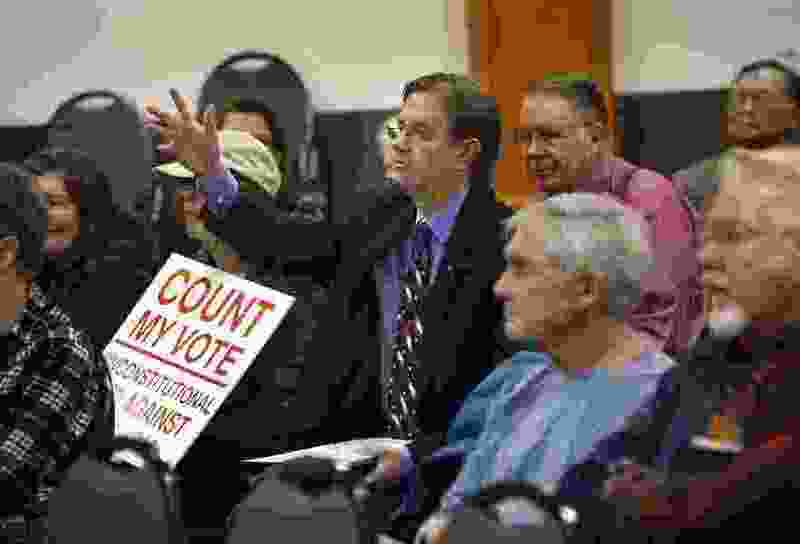 (Scott Sommerdorf | The Salt Lake Tribune) Former Utah Rep. Fred Cox tries to get recognized in order to ask a question during the Count My Vote public hearing at the Whitmore Library in Cottonwood Heights, Friday, Oct. 27, 2017. The U.S. Supreme Court on Tuesday asked the state of Utah to respond to an appeal by the Utah Republican Party that seeks to overturn a law allowing candidates to qualify for the ballot by collecting signatures and/or by using the caucus-convention system. The party says the court’s request shows it is taking serious interest in the case and in the argument that the state should not be able to tell the private organization how to select its nominees. The state last month filed a waiver saying it did not plan to respond to the GOP’s petition asking the high court to hear the case unless requested to do so by justices. On Tuesday, the court did just that. “We are grateful the Supreme Court is taking the case seriously and requesting the state of Utah to respond,” said Don Guymon, spokesman for the Utah Republican Party Constitutional Defense Committee. “It was disappointing that the state decided not to respond to this serious question of constitutional law on its own,” he said. The party argues in its appeal that the 2014 law, called SB54, interferes with its constitutional right of association to select nominees as it chooses — and it prefers to use only the traditional caucus-convention system. The law was a compromise to stop a ballot initiative that seemed poised to scrap the caucus-convention system and replace it with a direct primary. Count My Vote, which pushed the initiative, said the caucus system tends to give extremists in parties extra power and helps nominate people outside the political mainstream. SB54 has split the Utah Republican Party. Republican leaders such as Gov. Gary Herbert and Sen.-elect Mitt Romney, along with business groups and party moderates applaud the new law that allows signature-gathering to attain ballot status. Many of the party big-business donors quit writing checks to the party out of fear their money would help fuel the lawsuit. Conservative Sen. Mike Lee and Rep. Rob Bishop, along with Republicans who dominate the party’s Central Committee, want to elevate the convention system as the sole path to the ballot, and they have pushed the legal challenges. When Utah GOP Chairman Rob Anderson tried to stop the lawsuits by saying the costs were bankrupting the GOP, the Central Committee stripped him of such powers and created a Constitutional Defense Committee to make decisions on the appeal. The party had at one time amassed a $410,000 debt in pursuing the case. But earlier this year, Dave Bateman, CEO of Entrata software, stepped in and “acquired the debt” from party lawyers — who settled for about 40 cents on the dollar — with some strings attached. He demands appeals proceed at his expense, or that the party refund him.